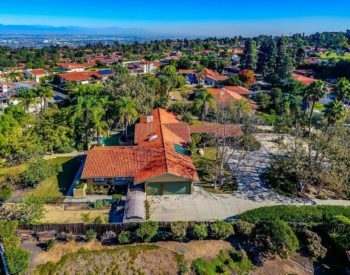 Valmonte homes for sale are located in one of the most charming areas of Palos Verdes real estate. Valmonte can be found just east of Malaga Cove, and it borders the Hollywood Riviera area of Torrance on the North and East. This area is known for its prevalence of Eucalyptus trees as well as its winding trails. Valmonte’s location allows for nearly perfect year-round weather. There’s not too much fog, wind or heat here. The area has a very rural atmosphere. There are no sidewalks, street lights, or traffic signals. Instead, there is a wide park-like median on Palos Verdes Drive North. This provides a safe place for residents to walk, jog or bike. There is a neighborly feel to the community. The style of Valmonte homes for sale further add to the neighborly atmosphere of the area. These homes tend to be somewhat smaller than other homes within Palos Verdes real estate. Most Valmonte homes for sale were built in the mid 1900’s. The typical architectural style for these homes is Spanish and Traditional. There are other style available however, including ranch, contemporary, craftsman, Cape Cod, and Mediterranean. Home price ranges from $900,000 to over $15,500,000. Home size ranges from 1,500 square feet to over 6,000 square feet. Some homes have city lights or golf course views but most are situated along quaint rural lanes. social activities at this golf club. It is a great place for residents to hang out, relax and have fun. What's My Valmonte Home Worth? Based on information from California Regional Multiple Listing Service, Inc. as of April 25, 2019 09:33 and/or other sources. All data, including all measurements and calculations of area, is obtained from various sources and has not been, and will not be, verified by broker or MLS. All information should be independently reviewed and verified for accuracy. Properties may or may not be listed by the office/agent presenting the information.